My sister in law was in town recently for her upcoming wedding shopping and the one thing she was very clear about, was to have a contrast dupatta look for her wedding lehenga. She didn’t want a head to toe one color theme going on, and pretty much refused to see anything which was only red, only orange, only pink in color. Contrast seemed to be the order of the day. So with that instruction in mind, we went ahead for her wedding lehenga shopping. While the contrast dupatta along with the double dupatta style has been in the trend for awhile now…the market is still primarily flooded with the one tone colored wedding lehengas. The only time when I saw options with dual tone lehenga shades were those designer first copies like Manish Malhotra’s floral maroon velvet lehenga with rose gold sheer dupatta or the quintessential Sabyasachi double dupatta looks. It is a tough decision to make. Every time my sis in law saw a wedding lehenga, she kept pulling other dupattas hanging on other mannequins to try out the contrasting look. Does soft gold go with blood red, or will rose gold also go well with it? Should we go for a lighter shade of the same color as the contrasting dupatta or choose something totally different? 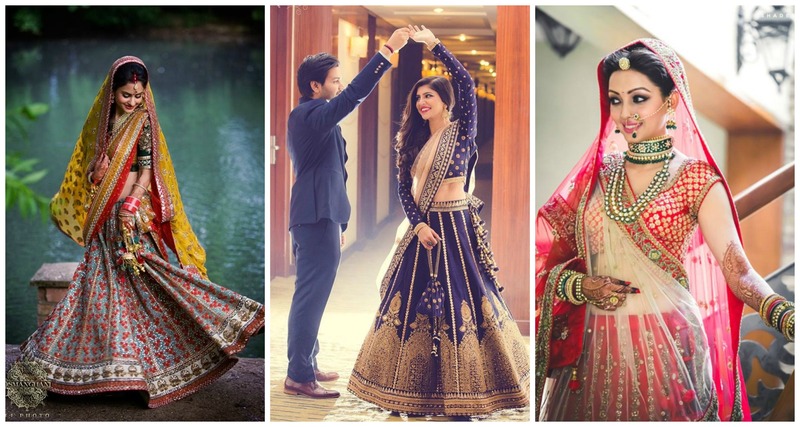 If you are also struggling with the same questions in your mind, then I am sharing here with you some of the Pinterest inspirations to help you choose the perfect contrasting dupatta for your wedding lehenga. I am seeing this trend everywhere. Its the easiest choice of contrast dupatta that you will find for your wedding lehenga. Less risky, looks great considering pastel shades are in trend and 90% of the cases, it makes the color of your wedding lehenga pop. Next time you visit a store, just try a pink on pink lehenga vs. a rose gold dupatta with pink lehenga. You will know what I’m talking about. Couple of years ago, actually even as recent as 2-3 years back…there was this trend of 3 colored lehenga. The blouse was of one color, then one color dupatta, and a third color lehenga skirt. It was the worst thing ever. I have some cousins and friends who wore that style in their wedding, and OMG the pictures look so tragic now. It used to be either pink orange yellow combo, or red blue green. The easiest finds. But thank heavens that fashion has disappeared. Even when I was searching for my wedding lehenga, there were traces of the tri color fantasy going on in many stores, and I was struggling. But with time, now I see better options in the tri color contrast lehengas. They are not too loud on the face, and the colors do complement each other. The best part about going for a tri color lehenga, each garment piece can be mismatched and reused later after the wedding as well. I have been seeing this lehenga style on Pinterest for quite some time now, but I had no idea it was from this designer Swati Manish. I am loving her designs. They are basic yet beautiful. Can you guess the common thing running through all her lehengas? Its the same color border = same color/patterned dupatta. I love how in sync the outfit is. Don’t you? P.S. Does anyone know the price of her lehengas? Velvet looks amazing with lighter contrast dupatta. The fabric in itself is so rich and opulent, that it doesn’t need something as heavy to match up to it. I love love how Sabyasachi keeps the focus on the lehenga skirt while giving the bride a dream like contrast dupatta. If you can’t afford the same style velvet wedding lehengas, head over to CTC Mall in Moti Nagar, I saw the first copies of similar looking lehengas. You can’t tell the difference. They are really really good. Price range 1-1.5lakhs. My favorite kind. Just how pretty does this bride look. At first glance, you can’t tell its a contrast dupatta because the lehenga and the blouse have subtle hints of the shade all over. Be it the blue or the pink, a closer look will show you the outfit is not so much in contrast, but in a way still is. If you’re aspiring for a fairy like dainty look for your wedding day, this is the best pick for you. Do you have any store in Ahmedabad or Mumbai. If you have any store in this place please give me address & phone number. I do not have a store, as the lehengas I share are from different designers. You can shop online on the website by clicking here.